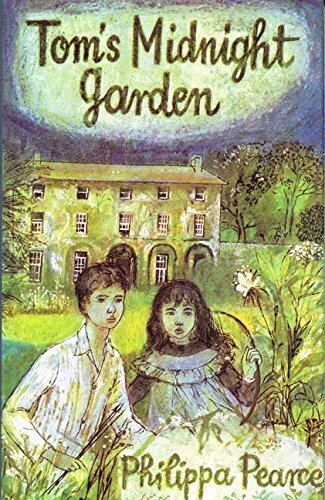 After reading the time-travel Four Seasons of Lucy McKenzie, it made me want to go back to reread a very similar, classic time-travel story, Tom’s Midnight Garden by Philippa Pierce. And maybe it’s just because I read it when I was a kid, or maybe it’s the style, but I found it to be delightful. The story begins when Tom is sent away for the summer to his aunt and uncle’s house because his brother has the measles. Tom misses his brother and hates his exile…until one night he hears the old grandfather clock downstairs striking thirteen. Venturing downstairs and out the back door, Tom finds a wonderful garden, not at all like the dingy yard and crowded subdivision he knows surrounds his relatives’ house. He visits the garden every night, where time seems to run differently and it’s always summer. There he makes friends with a little girl named Hatty, and they explore the garden together. This is in some ways a quiet book–there’s no big conflict, no huge obstacles to overcome, and no particular plot even. It’s just a story about a boy who finds–and then fears losing–a magical place, and makes a dear friend along the way. But the whole book is so whimsical and light and charming that I didn’t mind at all that there was nothing bigger at stake. I just told you in my review of Lucy McKenzie that I prefer dynamic time-travel (the past changes the present), but this book seems to be an exception. Tom doesn’t change the present, and it’s not even very clear that his actions in the past have any effect. But that’s okay somehow, perhaps because the book so clearly isn’t trying to do anything more than that. Maybe what I really don’t like about fixed time-travel (actions in the past inevitably create the pre-existing present) is that people strive so hard, and then nothing changes anyway. Here, Tom is just having a pleasant adventure. I also thought Lucy McKenzie was a bit obvious in who Lucy was meeting in the past. Adult readers of Tom’s Midnight Garden will probably guess who Hatty corresponds to in the present, but it is more subtly hinted at, and there’s actually some nice red herrings and misdirection to keep it more uncertain. I suppose at the end of the day, this is simply one of those very British, very charming classic fantasies…and I love those. So I was perfectly happy to go for a visit into a charming world with Tom. And it concludes with a beautifully touching final scene. Sometimes you just need a quiet book that is a pleasant read. This one sounds like it fills the bill perfectly. Thank you!!! I read this when I was a kid but forgot the name and could never find it again. I am thrilled I’ll be able to find it now!